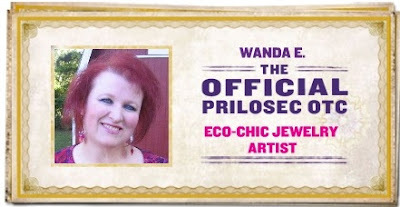 Wanda Maria Designs: "Eco-Chic Jewelry Artist"
I am now the OFFICIAL PRILOSEC OTC ECO-CHIC JEWELRY ARTIST!!! You can find my page on the Prilosec OTC site here. I'm so appreciative of this opportunity and want to thank Prilosec OTC and all of the wonderful people who voted for me in this challenge. I appreciate all of the sweet comments left on my page and all of the words of support and encouragement. THANK YOU, THANK YOU, THANK YOU!!! With the money received from this sponsorship, I'm planning to reorganize my craft studio with more shelving, book cases and the like to help me get better organized. 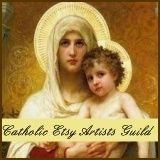 I'm a huge collector of all kinds of fabric and arts and crafts supplies, and this will enable me to get many of these items out of boxes and out where I can have easy access to them. By doing this, I hope to create some new projects and tutorials that I can share here on my blog. Thanks a bunch to everyone!!! This one-of-a-kind necklace was created using a vintage enamel brooch and earrings from the 60's that I disassembled and upcycled into a necklace. Vintage powder blue enamel chain, complementary beads and filigree complete the look. To enter, just leave a comment under this blog post only. (Important: Please make sure I will be able to get in contact with you if you are selected the winner.) On Saturday, September 3, a winner will be selected utilizing a random number generator. Good luck to everyone! And...let's not stop there. From now through the entire month of September, I am offering a 20% discount towards all purchases made in either of my Etsy stores - Two Crafty Mules and RetroEclectica. Just be sure to enter code "ECOCHIC" at checkout to get your discount.